Chances are that at any given time, in any given anchorage around the world, there is a boat with a malfunctioning refrigeration system. Why has it not been fixed? Because few people have the expertise needed to make repairs. Refrigeration is widely considered a "black science" but the principles are actually quite simple. The best way to master refrigeration is by taking it head on and building your own system. In building your own system, you gain the knowledge and experience needed to repair not only your own system, but those of others as well. You will know exactly what is in it and how it works. 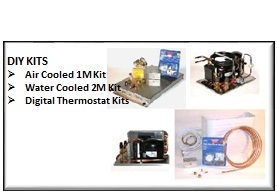 RPARTS.COM has retained one of the top refrigeration specialists in the marine industry to develop a line of do-it-yourself (DIY) refrigeration systems. These systems are designed for those who are hands on and enjoy building it yourself. Taking this hands on approach not only serves as a lesson in basic refrigeration 101 but there is also the added benefit of saving money. Our kits are priced significantly lower than that of name brand systems with a savings of up to 40%. All systems can be assembled easily using the components and detailed assembly and installation manuals included in the kit. Once completed, your system will match or surpass the performance of all the name brand systems. Limited warranty is offered for all kits. See the DIY Kits warranty for details.